Rose Facial Toner with Rose Distillate & Aloe Vera is formulated with botanical extracts to improve the skin's moisture content, tighten pores and promote firmness. This exquisite formula hydrates, heals and nourishes the skin. It is a cooling, soothing facial toner and perfect for all skin types. Rose has been used in skin care since ancient times. It is beneficial to all skin types and is especially valuable for dry, sensitive or any skin type. Rose Distillate has natural anti-bacterial qualities. 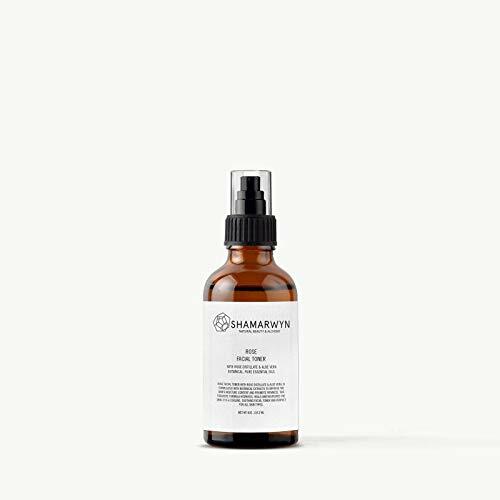 Shamarwyn products use Pure Essential Oil of Rose and Rose Distillate. Aloe Vera Gel soothes and heals and has long been praised for its medicinal effects. Aloe Vera contains vitamins C and E, both of which are known to be vital for healthy skin and also help to improve natural firmness, leaving your skin soft, supple and hydrated! Witch Hazel is healing and soothing to the skin. It is especially beneficial for those with acne. Vegetable glycerin is a natural emollient that has a cooling effect on the skin. Gentle on all skin types and suitable for daily use. View More In Creams & Moisturizers. If you have any questions about this product by Shamarwyn: Natural Beauty & Alchemy, contact us by completing and submitting the form below. If you are looking for a specif part number, please include it with your message.